She has yet to receive compensation from the State, after receiving a full apology for how her case was handled. 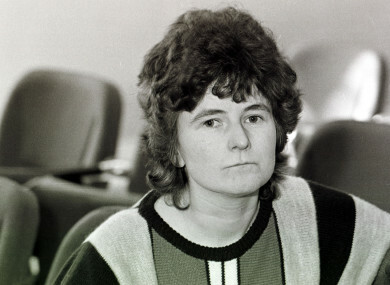 Joanne Hayes at a hearing of the Kerry Babies Tribunal in 1985. THE WOMAN WHO was wrongly accused of murdering a baby in Kerry in the 1980s has filed High Court action against the State, a year after she received an apology from the Taoiseach over her treatment in the case. Joanne Hayes is set to sue over being wrongfully arrested and subsequently charged with the murder of ‘Baby John’, whose body was discovered on a beach near Cahirciveen in Kerry. After receiving apologies from the State last year, she has yet to receive compensation and this week filed High Court action against a number of parties, including the gardaí and the State. The investigation into the 1984 death and subsequent Tribunal into the child’s death centred on Hayes, as she faced accusations that she was the baby’s mother and had killed him. The case gained notoriety in the media, with Hayes gaining sizeable public support with critical commentary on how she was treated by authorities. A garda review of the DNA evidence just last year proved that Hayes was not the mother of the child, and she has since been exonerated. In January last year, both the gardaí and the government apologised to Joanne Hayes. Acting Garda Commissioner Dónall Ó Cualáin wrote to Hayes to formally apologise to her on behalf of An Garda Síochána. Speaking at a press conference to coincide with this in Kerry, Superintendent Flor Murphy said: “It is a matter of significant regret for An Garda Síochána that it has taken such a long time for it to be confirmed that Ms Hayes is not the mother of Baby John,” he said. On behalf of An Garda Síochána, I would like to sincerely apologise to Ms Hayes for that, as well as the awful stress and pain she has been put through as a result of the original investigation into this matter, which fell well short of the required standards. Leo Varadkar said that Joanne Hayes had been treated very badly by the Irish State. Following these apologies, the issue of compensation that would be offered to Hayes came to the fore, with Tánaiste Simon Coveney telling the Dáil he was not at liberty to speak about compensation for Hayes but said that it is something he is sure the Government will want to act quickly on. Last month, the Irish Daily Mail reported that an agreement had not yet been reached with Hayes regarding compensation from the State. In separate filings, her siblings Michael, Kathleen and Edmund have also issued proceedings against the same parties as Joanne – An Garda Síochána, the Director of Public Prosecution, the Department of Justice, the Attorney General and the Irish State. TheJournal.ie has contacted the parties involved for comment in relation to this matter. An Garda Síochána said it had no comment to make. A spokesperson for the Department of Justice said: “Ms Hayes has asked for her privacy to be protected and we have sought at all times to respect her wishes, while endeavouring to reach a settlement with her and others in this complex case. Email “Joanne Hayes set to sue the State over her treatment in Kerry Babies case”. Feedback on “Joanne Hayes set to sue the State over her treatment in Kerry Babies case”.